Offering over two-hundred GigE Vision camera models, Machine Vision Store likely has the camera you need. Resolutions range from VGA to 29 Megapixel. Certainly contact us for help choosing the best camera for your project. High data rates - up to 100 MB/s with a single gigabit link, or even greater with a 10 gigabit link or dual links. Up to 100 meter cable lengths, or longer with repeaters or fiber optic converters. The greatest selection of different camera models, from .3 to 29 megapixel resolution, with monochrome, color or IR sensors, in area scan and line scan formats. Some GigE Vision devices support Power-over-Ethernet, so a single cable can be used for both data and power. GigE Vision Control Protocol defines camera control and configuration. GigE Vision Stream Protocol defines data types, and how images can be transferred. GigE Device Discovery Mechanism provides the means to obtain IP addresses for cameras. A file describes a camera's behavior, such as the parameters and streams it supports. This XML file uses a schema based on the GenICam standard, and GigE Vision therefore has a lot in common with the Camera Link HS and USB Vision standards. GigE Vision devices use UDP/IP protocol for efficiency, and include a mechanism for resending images if necessary. Despite its name, the GigE Vision standard does not specify a baud rate. Although 1000 Mbits/s is typical, devices could use 100 Mbits/s or 10,000 Mbits/s. When should I use GigE Vision cameras? Supports the longest cable lengths — 100 meters, or longer with repeaters or fiber optics. Unless you require both very high resolution and a very high frame rate, GigE Vision is a good choice. What's the difference between gigabit Ethernet and GigE Vision? We're all familiar with Ethernet. Commercially introduced back in 1980, it was later standardized as IEEE 802.3. Ethernet comes in various flavors, the most common today being 1000BASE-T. This "gigabit" Ethernet finally delivered sufficient bandwidth for many machine vision installations. The GigE Vision standard was built on top the Ethernet foundation. 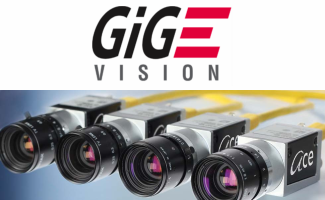 GigE Vision has standardized the means of finding, configuring, and receiving images from cameras over Ethernet. In doing so, GigE Vision compliant cameras are interoperable and, at least theoretically, interchangeable. It is GigE Vision that enables us all to use one software package to communicate with most any compliant camera. That said, the free GigE Vision software drivers provided by camera manufacturers tend to only communicate with that manufacturer's cameras. The drivers designed to communicate with all GigE Vision cameras generally have a runtime licensing fee. Power-over-Ethernet, often called "PoE", enables a single cable to be used for both data and power. This eliminates the need to purchase and pull two cables to each camera, thereby reducing total system cost. PoE is implemented one of two ways. For 10BASE-T and 100BASE-TX Ethernet, power can be sent over spare conductors in the data cable. This is described in IEEE 802.3 as "Alternative B." For 1000BASE-T Ethernet, there are no spare conductors. Power is instead transmitted by applying a common-mode voltage to each pair of conductors. Since twisted-pair Ethernet uses differential signaling, the power does not interfere with communication. This is described in IEEE 802.3 as "Alternative A." The PoE standards provide for signaling between the power source and the powered device. This signaling allows the power source to detect a PoE compliant device, and to negotiate the amount of power to be supplied. The original IEEE 802.3af-2003 provides for up to 15.4 W of DC power, with a minimum of 350 mA at 44 VDC. Only 12.95 W may be available to the device because power is dissipated in the cable's small-gauge conductors. This power level is sufficient for many modern cameras. The updated IEEE 802.3at-2009, sometimes referred to as "PoE+", provides up to 25.5 W of power. But some devices offer up to 51 W of power. Examples of devices that can power a PoE compliant camera include an inline PoE injector, PoE network cards, and computers having built-in PoE ports. Additional information about PoE is available at Wikipedia, and in Basler's white paper Advantages of Power over Ethernet. How do I choose a network card? Machine vision cameras are one of the highest-bandwidth devices a network interface card is likely to ever encounter. Don't be misled by web cams tossing low resolution images across Wi-Fi, or even by streaming HD movies into your living room. Machine vision cameras send uncompressed images, which requires far greater bandwidth. And, typically, not a single image can be dropped. In general, there are two types of GigE Vision drivers. Filter drivers are compatible with nearly all Ethernet chips. The driver examines each Ethernet packet to quickly separate camera data from other traffic, sending the camera data directly to an application. Filter drivers generally place a greater load on the host CPU. This is especially true as the traffic level increases. When using a filter driver, other devices can share the Ethernet port with GigE Vision cameras. Performance drivers offer, well, greater performance. The load on the CPU is reduced. Disadvantages of performance drivers include the fact that only specific Ethernet chipsets are supported, and only GigE Vision cameras can be connected. Performance drivers tend to offer more robust communication. For example, they do a better job of resending an image if it was corrupted in transit. So, if you want to use a performance driver, you'll need to use an Ethernet chipset that the driver supports. In the case of Basler Pylon 4.1, this means one of the following Intel chipsets: I210, I340, I350, or one of chipsets found in the Intel Pro 1000 series adapters. Be sure to review documentation for the driver that you choose to use. Network cards are not all created equal. Regardless of which card (or computer motherboard) you choose, look for jumbo-packet support. Ethernet IEEE 802.3 specifies only packets having up to 1500 bytes, which means that the host CPU must be interrupted frequently. Many better network cards support packet sizes several times greater. And if you're using a camera having dual GigE Vision ports, choose a network card that supports port teaming. Our industrial computers feature chipsets supported by the Basler Pylon performance driver, and can power cameras using Power-over-Ethernet. Can I use a network switch or router? We generally recommend using a dedicated network port for each camera. If the port offers Power-over-Ethernet, you'll save money by not having to purchase a power supply for each camera. And overall performance is maximized. If you're using a couple cameras having low resolution and running them at a slow frame rate, then you could put them on the same subnet by using a network switch or router. Contact us for help determining whether your hardware configuration allows the cameras to be placed on the same network. Even gigabit Ethernet is easily overwhelmed by uncompressed images. If you do use a switch or router, keep in mind that the device's chipset will influence overall performance. What do I need to know about Ethernet cables? Standard Ethernet cable is called "UTP," for unshielded twisted-pair. It has no shield, and therefore is not appropriate for the factory floor. The Basler ace manual states "To avoid EMI, the cables must be shielded." Additionally, cables must be shielded to comply with Subpart J of Part 15 of FCC rules for computing devices. Cables should have a shield around individual conductor pairs, and a second shield around the entire cable. Category 6 (or better) cables are necessary. You may wish to use screw-lock connectors to assure a solid connection. And high-flex cables rated for robotic applications are needed if the camera will be moving. Our catalog includes a selection of Ethernet cables appropriate for most installations. Where can I learn more about GigE Vision? Ordered by horizontal resolution, then frame rate. Contact us for information on additional models. Need help? Contact us now. Our experienced, AIA Certified Vision Professionals are ready.